Posted on 02. Dec, 2010 by Corey in All, Dayton Dragons Baseball. 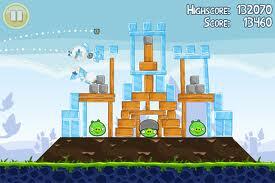 A major craze this summer appeared to be the new game from Rovio that appeared on Apple’s Iphone and Itouch devices. 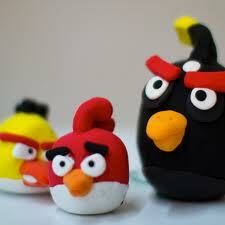 It was called Angry Birds, and actually quite simple to understand. You place birds or different shapes and sizes into a virtual slingshot and hurl them into the air, trying to explode a bunch of pigs on the other side. Sound pretty lame and stupid? No chance, it is pretty sweet and awesome! Working and traveling with the Dayton Dragons this season, the game took off and exploded throughout our team. Walking up and down the bus on road trips, more than half of the roster was playing the game, arguing who was the best player and comparing points on each level. Walk through the clubhouse minutes before they had to report to the field for the game, and you would still see guys clutching to their devices to squeeze another level in. Several members of the team even went out to buy an Itouch so that they could play along and join the fad. 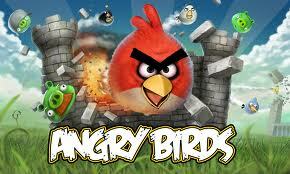 It did not take long before I too became officially addicted to Angry Birds and would play until my battery went dead. Unfortunately I was not as good as all the others and lagged behind in game progress. While some played each level until they got the most points allowed, I was happy sliding by and advancing to the next board any way I could. Every time I would get close to the end of the game, an update would come out with more challenging and exciting levels. Who knew for a mere 99 cents one could have so much fun! Life got even better when Rovio expanded their release of Angry Birds and it became available for the Android operating system, allowing me to have it on my cell phone. Rarely does a day go by where I don’t attempt to beat the next level by crushing some green pigs. This simple game has turned into a national phenomenon and a huge money maker for the company. They are now selling plush dolls and supposed to be releasing a video game for Xbox. 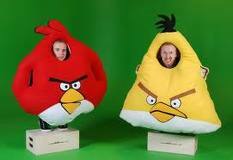 Even Haloween costumes were available to wear. 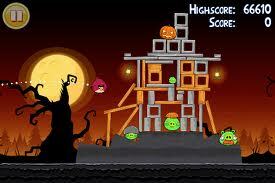 Just the other day a Holiday Edition of Angry Birds was released featuring levels with a Halloween theme or Holiday Winter theme. The hunger to own an Ipad has also increased as Angry Birds is available there in HD and has a much bigger screen to play on. I highly recommend you give this game a shot and guarantee you will be addicted in no time! If not, contact me and I will send you the 99 cents back. 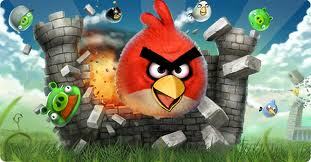 Angry Birds, just get it! Have you seen there is a “seasons” edition also? It has winter and Halloween levels…Fro now, I am playing just to advance each level and not worried about how many stars I get. Also finding those golden eggs can be tough! !